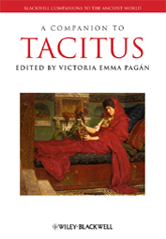 A Companion to Tacitus brings much needed clarity and accessibility to the notoriously difficult language and yet indispensable historical accounts of Tacitus. The companion provides both a broad introduction and showcases new theoretical approaches that enrich our understanding of this complex author.Tacitus is one of the most important Roman historians of his time, as well as a great literary stylist, whose work is characterized by his philosophy of human nature Encourages interdisciplinary discussion intended to engage scholars beyond Classics including philosophy, cultural studies, political science, and literature. Showcases new theoretical approaches that enrich our understanding of this complex author. Clarifies and explains the notoriously difficult language of Tacitus. Written and designed to prepare a new generation of scholars to examine for themselves the richness of Tacitean thought. Includes contributions from a broad range of established international scholars and rising stars in the field.